Desktop UC. Just the Way You Need it. Coordinated with Yeastar Cloud PBX and S-Series VoIP PBX, Linkus Desktop Client provides you with access to enterprise-grade telephony features from your computer desktop. It runs on Windows and macOS, and gives you softphone, instant messaging, presence, file sharing and CRM integration facilities. Just communicate and collaborate seamlessly and efficiently. Easily click to make, hold, mute, transfer and record a call to any phone number or extension. Missed a call? No worries, we keep all your call history right at your fingertips. When you’re not available for a call, simply type your colleague(s) a quick message and have an instant sharing of ideas regardless of where you are. See who is available, busy or offline immediately and intuitively with colored status indicator. Customized presence message allows your colleagues to know when and how best to contact you. 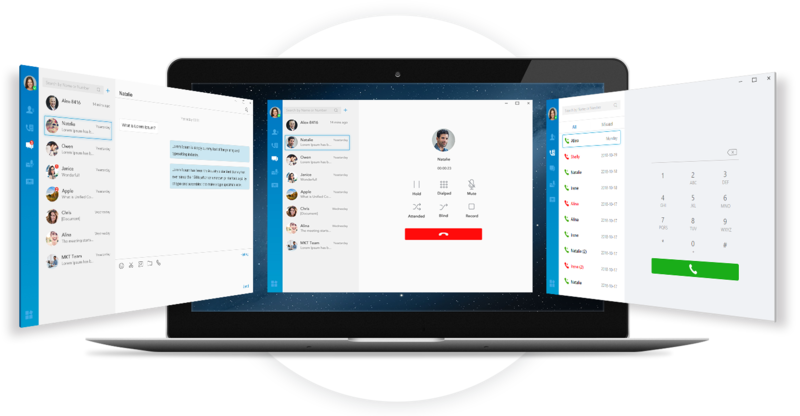 Call-pop and call journal from your Salesforce CRM, Microsoft Dynamics 365, Outlook Contacts and Google Contacts. Keep synced with your contact information when they calling in. More CRM support are coming. Reduce caller frustration and wait times by automatically forwarding calls to extension, mobile number, voicemail or any designated destination when you can’t accept a call. View all your colleague contacts and see details – extension, mobile number, and personal profile picture will all be unfolded with a simple click. Simply click on the Document icon on your chat box and you can choose any type of files to share. Super easy and secure. Need a hassle-free environment? Switch to Do Not Disturb Mode and concentrate on your urgent tasks without telephonic disturbances. Datasheet, User Manual, Configuration Guide, etc. The fully-loaded Linkus can be tested with Yeastar Cloud PBX free trial.